To customers who purchased a SEIKO PROSPEX Diver Scuba Cal. 4R35, 4R36 model in Japan which came with the M-14 instruction booklet. Please note that this error applies only to the instruction booklet for M-14 watches purchased in Japan. Thank you very much for continuing to purchase SEIKO products. 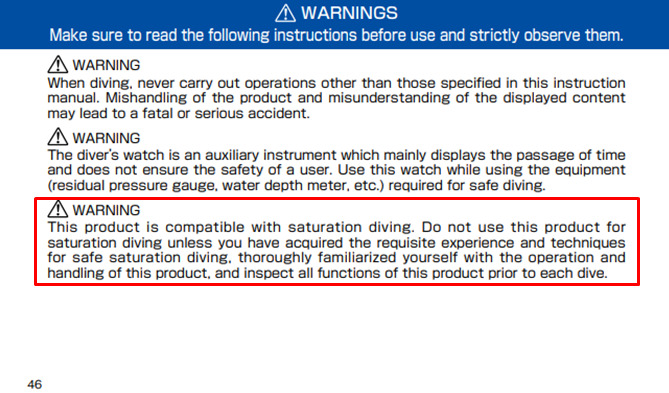 We have found an error in a description contained in the instructions for M-14 (water resistant for 200m diving, diver’s watch) back cover No. (BSN4R3CD-A1709 / BSN4R3CD-A1804) of the SEIKO PROSPEX Diver Scuba Cal. 4R35, 4R36 model released in Japan. There is an error in the description stating, “This product is compatible with saturation diving.” on P. 46. However, later in the instruction booklet, there is a correct warning indication stating, “Never use the product, however, in saturation diving” in the “Precautions for diving” on P. 56. The normal instructions for M-14 (Water resistant for 200m diving, diver’s watch) back cover No. (BSN4R3CD-A1806) are posted on our website. We would like customers who have the applicable instructions for M-14 (Water resistant for 200m diving, diver’s watch) back cover No. (BSN4R3CD-A1709 / BSN4R3CD-A1804) to discard the instructions you currently have and refer to the description posted on the above website. We sincerely apologize for causing any inconvenience or worry on the part of our valued customers. We will make every effort to enhance our control system in the future.